The foundation ‘ GiveThe Children of MPongwe a Future’ (GCMF, see www.mpongwe.nl) has built the George Korsten Vocational Training Center in MPongwe. The centre enables local students to get a degree in organic farming, bricklaying or carpentry. Once completed, the centre can host up to 500 students. GCMF called on Energy Assistance to assist in the design, planning and installation of the entire electricity system from the nearby Medium Voltage line up to the sockets and lighting in the building. 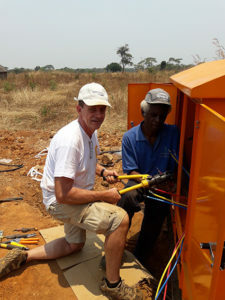 Throughout 2017, EA and GCMF made an inventory of the skills and a project plan was made which involved the EA volunteers, one subcontractor, a senior electrician in Zambia, 6 local students and 20 local worksmen. 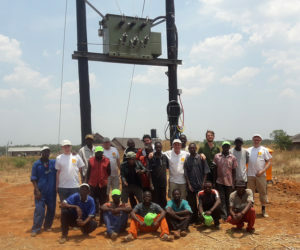 During this two-week mission mission, the EA volunteers and the local workforce finalized the connection to the Medium Voltage grid, commissioned the MV/LV transformer and equipped rooms with sockets, inside- and outside lighting.